↑ ক খ Contemporary Theological Trends in the Hare Krishna Movement ওয়েব্যাক মেশিনে আর্কাইভকৃত ১১ মে ২০০৮ তারিখে "Until the last fifteen years or so, there had been a lack of scholarship in the West on Vaishnavism, and this was seen by Hare Krishna devotees as a situation which must be changed." ↑ Brahma-Samhita 5.45 ওয়েব্যাক মেশিনে আর্কাইভকৃত ২৯ মে ২০০৯ তারিখে "The supremacy of Sambhu [Shiva] is subservient to that of Govinda [Vishnu]; hence they are not really different from each other... He is the lord of jiva but yet partakes of the nature of a separated portion of Govinda." 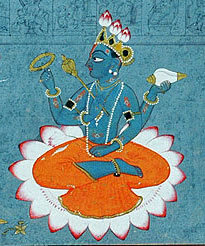 ↑ According to this site, http://www.kakaji.org/shikshapatri_verses.asp?catid=viewAll], verses 47, 84, of their scripture, Shikshapatri,  states, "And the oneness of Narayana and Shiva should be understood, as the Vedas have described both to be brahmaroopa, or form of Brahman, i.e., Saguna Brahman, indicating that Vishnu and Shiva are different forms of the one and same God. ↑ krishna.com "The names can be generic terms, such as “God” or “the Absolute Truth.” They can be in Sanskrit, such as Govinda, Gopala, or Shyamasundara. ↑ Bhag-P 1.2.11 "Learned transcendentalists who know the Absolute Truth call this nondual substance Brahman, Paramatma or Bhagavan." ↑ The Sampradaya of Sri Caitanya, by Steven Rosen and William Deadwyler III ওয়েব্যাক মেশিনে আর্কাইভকৃত ১১ অক্টোবর ২০০৮ তারিখে "the word sampradaya literally means 'a community'. A text from the Padma Purana quoted widely in Vaisnava writings speaks directly about these authorised communities. It says that 'Those mantras which are not received within a sampradaya are fruitless; they have no potency'. The text then specifically names the sampradayas. 'In the Kali-yuga, there will be four sampradayas.' ― we are talking about Vaisnava sampradayas­ ― 'They are the Brahma Sampradaya, originating with Brahma; Sri Sampradaya, starting with Laksmi; Rudra Sampradaya, starting with Siva; there's another one starting from Sanaka and the others, the Kumaras'. Those are the four recognised Vaisnava sampradayas." ↑ Klostermaier, K.K. 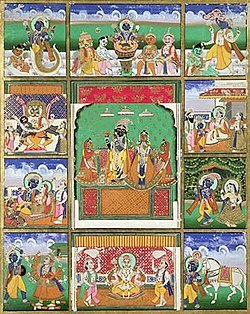 (১৯৯৮)। A concise encyclopedia of Hinduism। Oneworld। Vaisnavism and the founders of the four Vaishnava sampradayas are presented in separate entries. The Encyclopedia gives explanations about Gaudiya Vaisnavism, Caitanya Mahaprabhu, bhakti and bhakti-marga. ↑ Bhag-P 1.3.28 ওয়েব্যাক মেশিনে আর্কাইভকৃত ২৩ জানুয়ারি ২০১৩ তারিখে "krishnas tu bhagavan svayam"